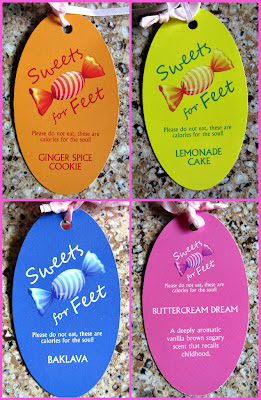 Sweets for Feet Review & Giveaway! Renowned acupressure and reflexologist Kathy Guditis developed Sweets For Feet, which combine sense memories from childhood with natural advances in skincare to heal one's body. Accustomed to using greasy and slippery moisturizers in her profession, Kathy wanted to create new products that would be hydrating, but non greasy. She developed a unique and effective mixture of Aloe Vera and Shea Butter combined with 8 exotic fruit extracts, giving these creams a therapeutic effect which can slow aging, increase levels of antioxidants in the body, and reduce pain, as well as high blood pressure. Best of all, Sweets For Feet can also be used on your hands, body, or face, as the Aloe Vera, Shea Butter and extracts heal dry facial skin. It was recently tested on the face at the Whole Body area of Whole Foods and passed with flying colors. Sweets For Feet are unmatched in their ability to hydrate and heal sore feet and tired toes. Four sugared fragrances – Buttercream Dream, Ginger Spice Cookie, Lemonade Cake and the rich Greek pastry, Baklava, are currently available, as well as a non-scented version for people with allergies, or sensitive skin. Sweets for Feet sent over a lovely package of hydrating foot care confectionaries, and they are delightful! 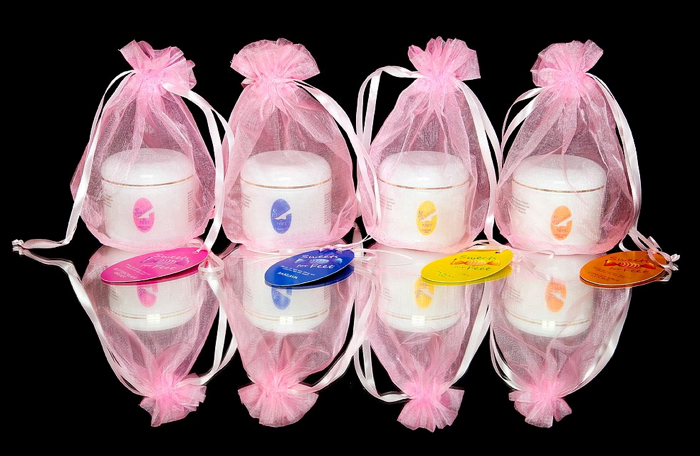 Delicious scents, non-greasy, natural and organic ingredients...what's not to love! These multitasking whipped cream formula products are infused with eight exotic fruit extracts, shea butter, aloe, and a host of other beneficial ingredients to treat and soften dry feet. 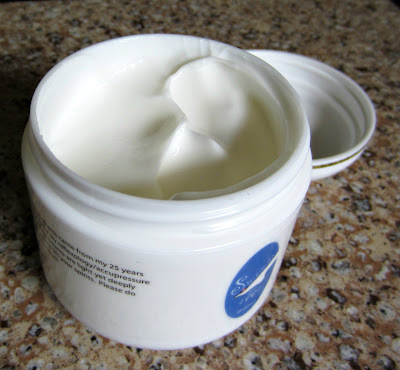 They also work well as a moisturizer on your hands, face, and body. The scents (above) are light and soft...gentle enough to not interfere with other scents you may be wearing, but scented enough to enjoy their notes. The formula is of medium consistency, and it absorbs and melts into the skin for immediate relief. I've been using this on my hands and feet with very good results, and my feet, which are often neglected, look and feel so much nicer. 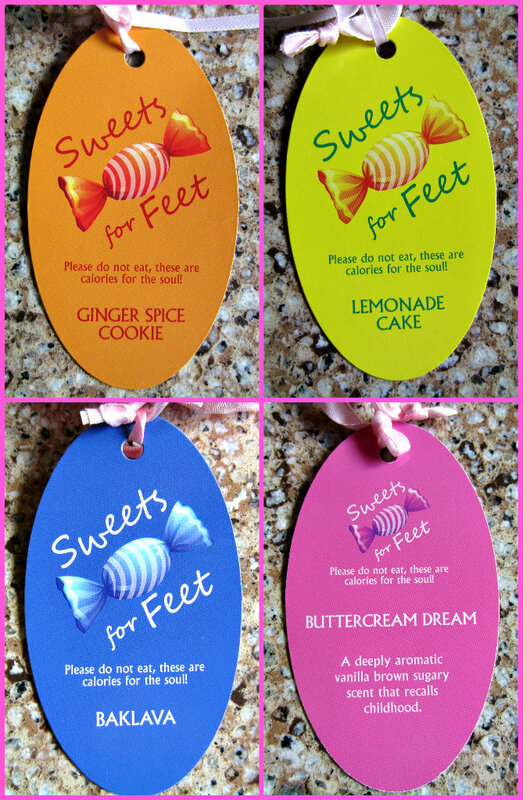 Sweets for Feet are available on their website at the link above, and they retail for $20.00 each (4 oz. jar). You can also check them out on Facebook here. Giveaway Details: I'll be giving away one jar of the Baklava, and one jar of the Ginger Spice Cookie! One lucky follower will receive these two yummy Sweets for Feet treats. If you'd like to enter for a chance to win, just leave a comment and let me know if your feet need a sweet treat! Be sure to leave your eMail, and if you aren't comfortable leaving it, check back on September 17 when I announce the winner, and we'll get in touch with each other. U.S. residents only. Contest ends September 16 at midnight, EST. *Products and prizes featured were furnished for consideration by the manufacturer or PR firm. My feet absolutely need a sweet treat. Especially with the dry winter air around the corner. Ginger Spice Cookie sounds delightful. Thanks, as always for all of the hard work that goes into your excellent blog! i could definitely use some sweet treats for my feet :) as i'm getting older, i'm noticing my heels get drier more often. My feet definitely need a sweet treat...the flavors sound so amazing and my hips really don't need any sweet treats! These sound awesome! Especially since they're non-greasy. Thank you for the giveaway. I could definitely use these! Dry, yucky feet are a band of my existence! I definitely need a sweet treat for my feet jogging has made them dry and gross. That sounds wonderful, my feet can benefit from a Sweet for Feet after a summer of wearing flip flops! Thank you for hosting this giveaway! My feet definitely need a sweet treat. Wearing sandals has ruffed them up this summer. My poor feet are so cracked and dry they are considered weapons of mass destruction! hug Would love, love, love a sweet treat! My feet certainly need a sweet treat. I love flip flops and live in them all summer. It was so chilly here in NH yesterday that I had to put on socks last night for the first time since spring. cool! even if I don't win this I'm going to buy one for my mom. We tried so many lotion and creams but nothing works on her crack feet. Oh, my aching feet. My feet are so unhappy. Don't remember when I last had a pro pedicure with the massage and all and I'm not very good at bending down and scrubbing and oiling and pampering my tootsies. They are screaming for a treat or two. Wonderful Giveaway. My email is elul5704@gmail.com. Thaaaaank Uuuuuuuuuuuuu! As winter is knocking the door, definitely need a sweet treat for my foot.Love to try it. My feet absolutely need a treat; they are feeling very unloved these days. These are my favorite kinds of scents too so I would love to try them. Thanks for the chance to win them! Polio left me with one leg shorter than the other, as well as a clubbed right foot; therefore, my "good" leg and foot really take a severe beating from a lifetime of compensation. I'm always trying to find a way to relieve the pain, burning, severe cracked and dry skin, and pressure; even my podiatrist can't offer a permanent solution! Yes, my feet could definitely use a "sweet treat". Thank you so much for having this great giveaway. I would love these! I have severely dry skin on my hands and this past summer noticed it has decided to take residence on my feet, too. Thanks for this giveaway! My feet could definitely use a sweet treat - they're so dry right now! What feet don't need a sweet treat? My heels are already getting dry and wanting to crack. These are exactly what I need to keep them soft this winter!